Underwater photograph of sick and dying sunflower star. In 2013, marine scientists witnessed a real-life, aquatic version of Contagion. Over the summer, divers in Monterey, California were treated to a horror scene of sea stars with limbs torn asunder and bodies disintegrating. Soon, major aquariums up and down the West Coast reported their sea stars went from paragons of health to dead in weeks. Beaches became littered with dead and dying sea stars or their remnants. Scientists knew little about the disease causing them to waste away. While its origins remain a mystery, new findings show it was turbocharged by the freakishly warm blob of water that engulfed the U.S. West Coast from 2013 to 2015. The research, released Wednesday in Science Advances, also reveals just how dramatically it reshaped the sea star communities along the coast, including completely wiping out sunflower stars from large parts of their range. The impacts show how infectious diseases and climate change can interact in terrible ways, and that in the oceans, those impacts could catch us off-guard. Harvell and her fellow researchers used nearly 20,000 observations collected from dives and trawling from 2004 to 2017 to get a handle on sea star populations from California to Alaska, including British Columbia. The data chronicles sea star abundance from before and after the disease hit. They also pulled satellite ocean temperature data to look at its relationship with the sea star die-off. The findings show that once the disease showed up in 2013, sea star populations fell off a cliff. And when the Pacific got super warm thanks to the blob in 2014, the die-off got even more extreme. Underwater photograph showing initial outbreak at Sackinaw Rock, BC, Canada. The two photos were taken 20 days apart at the same location in October 2012. In total, 20 types of sea stars were impacted by the disease, but the study focuses on the sunflower sea star. In the 2000s, they were reliably found up and down the coast in colonies of dozens or even hundreds. But since 2014, they’ve been practically eradicated. The findings show 100 percent drop in biomass in large swaths of coastal California and Oregon, 99.2 percent in Washington, and 96 percent in British Columbia. All that is a fancy of way saying they’ve basically been completely wiped out. “For the correlation with elevated water temperature, I think the data are as sound as they can be, given the limitations of the data sets,” Melissa Miner, a researcher at the University of California, Santa Cruz who has also studied the star die-off, told Earther. She praised the study as a whole but pointed to the need for direct water observations to really be able to hone in exactly how sea star wasting disease and hot water interacted. 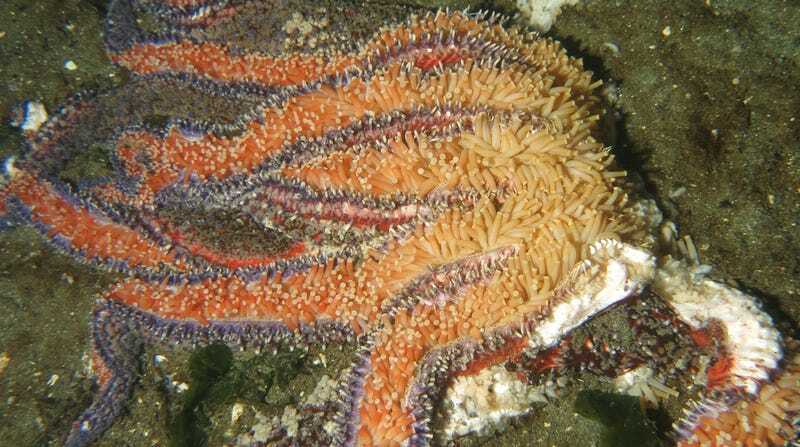 Harvell said that with the sunflower sea star largely gone along the West Coast, the main hope for its recovery is that populations in Alaska are still trucking along. One possible path forward is breeding them in captivity to ensure a viable population exists while researchers try to unravel the cause of the sea star wasting disease. Other stars are showing some signs of recovery and could also help researchers understand what happened and prepare for when the next oceanic calamity inevitably hits. This post has been updated to note divers were in Monterey, not Monterrey (which is in Mexico and nowhere close to the coast).